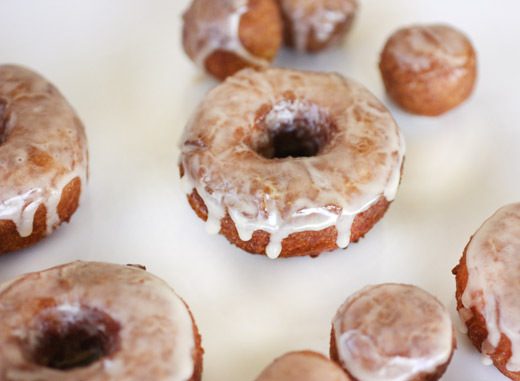 As soon as apple cider appeared this fall, I started thinking about apple cider doughnuts. I'd see them mentioned here and there, crave them more, and hope I could find time to make them the next weekend. I'd never made them before and didn't have a particular recipe in mind, but I was sure there must be some reference to doughnuts made with apple cider in at least one of my books. There wasn't. 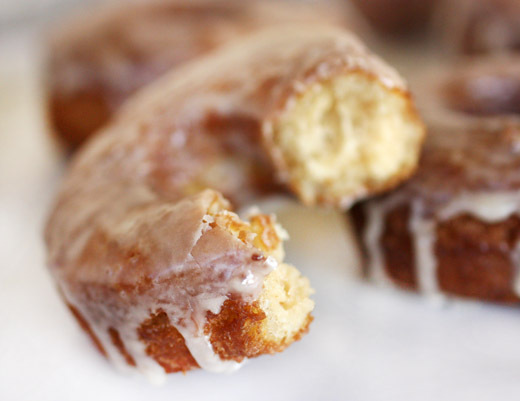 I found buttermilk cake doughnuts, yeast-risen doughnuts, baked doughnuts, beignets, and nearly every imaginable version of fried dough except apple cider doughnuts. Thankfully, a quick online search led me to The Washington Post and a story from 2004 with the recipe I used here. At that point, so many fall weekends had slipped by it was already Thanksgiving, and I decided a breakfast of apple cider doughnuts would be the best possible way to start the day. Actually, working on these doughnuts while I had several other reasons to be puttering around the kitchen worked out well. It's not exactly a quick-as-can-be kind of process. 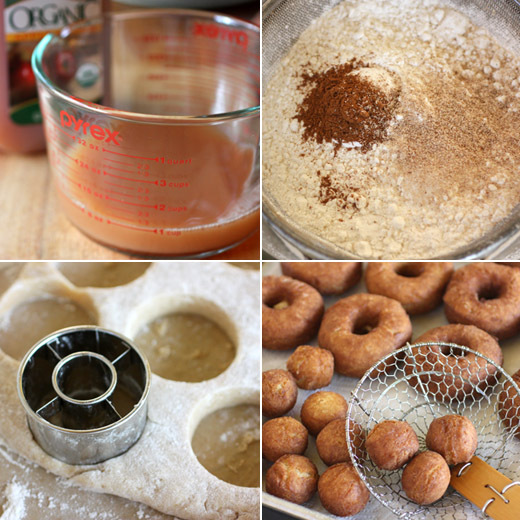 The apple cider had to be reduced, and then the dough needed to be chilled, and then the cut doughnuts and holes required refrigerator time before being fried. In between each of those steps, I was organizing pots and pans and making sure everything was ready for the big meal later in the day. So, I warned you this recipe requires a little patience, but one taste of the warm, glazed doughnuts will convince you it was all worthwhile. First, butter needs to come to room temperature. Let that sit on the counter while a cup of apple cider is reduced to one-quarter cup which takes about 30 minutes. Then, combine flour, baking powder, baking soda, cinnamon, salt, and freshly grated nutmeg in a mixing bowl. With a mixer, beat butter and granulated sugar, and add eggs and mix until incorporated. The reduced and cooled apple cider and some buttermilk should be added next and mixed to combine. Next, the flour mixture is added and mixed just until the dough forms. The recipe instructions guide you very well through the next few steps. You prep two baking sheets with parchment sprinkled heavily with flour. The dough is turned out onto one of those sheets, and the dough is sprinkled with more flour and flattened with your hands to a one-half inch thickness. That sheet pan with dough is then placed in the freezer for 20 minutes. Once chilled, the dough is cut into doughnuts and doughnut holes which are placed on the second prepared baking sheet. That pan with cut shapes is then refrigerated for 20 to 30 minutes. While the cut doughnuts chill, the oil is brought up to 350 degrees F in a wide, heavy-bottomed pan. Frying is the quickest step of all since the doughnuts only require 30 to 60 seconds per side. They're then placed on a sheet pan lined with paper towels to drain, and the glaze is made. Confectioners' sugar and apple cider are whisked together for the glaze, and the warm doughnuts are dipped into it and then devoured. Doughnuts are always at their very best when freshly made and still warm. But, if you wanted to attempt making these in advance, I suggest waiting to glaze them at the last minute and re-warming them in the oven right before dipping them in the glaze. The thin glaze runs down the sides of the warm doughnuts and leaves just the right amount of coating. These did make for a deliciously sweet start to Thanksgiving day, but I don't think there's ever a bad time for doughnuts. Only on very rare occasions does Kurt make meal suggestions. I suppose I’m lucky that most of the time he’s happy to partake in whatever meal I’m planning to concoct. So, it’s a bit of a surprise when he does mention something particular he’d like to have. A few weeks ago, he started talking about how we hadn’t gone out for pho in a long time and then suggested I should try making it or something similar. Since I probably won’t hear another food request from him for the next year, I jumped at the opportunity to deliver on this one. I remembered a soup from Dorie Greenspan’s Around My French Table that she describes as a mix of two of her favorite Vietnamese soups: pho ga which is a clear broth soup with noodles and la sa ga which is a curried coconut milk soup. She orders both frequently at Kim Lien in Paris. 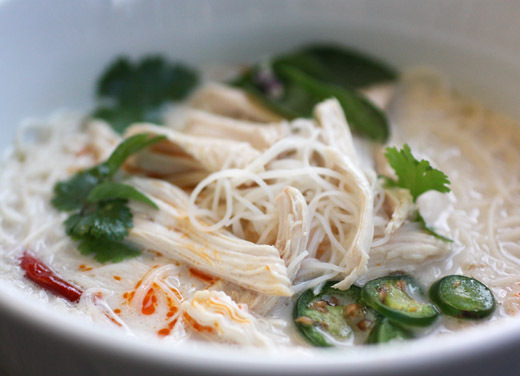 The combined soup in the book brings together the chicken broth, shredded meat, and noodles with coconut milk and lots of great flavors from lime, chiles, ginger, and spices. 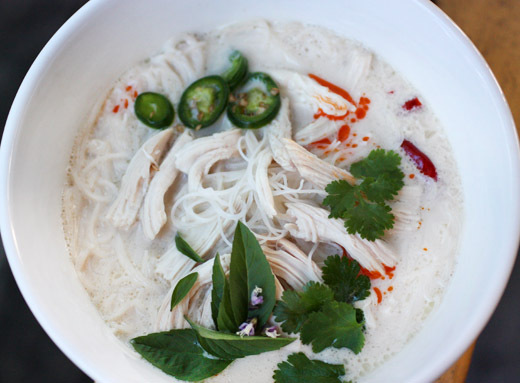 It’s easy to prepare since the chicken poaches in the broth and coconut milk of the soup, and while it’s cooking, you can ready the noodles and garnishes. 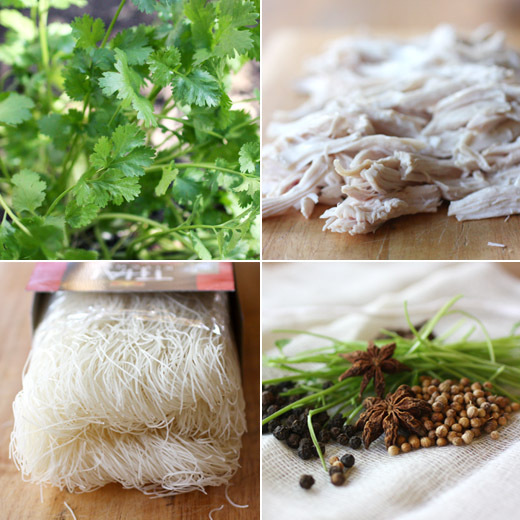 The first step of this soup is to make a spice packet with cilantro stems, star anise, coriander seeds, and peppercorns in some cheesecloth tied with kitchen twine. I always have cilantro in my herb garden in the fall, so I picked enough stems to use and saved the leaves for a garnish. The spice packet was added to a soup pot with chicken broth, coconut milk, finely chopped onion, sliced garlic, minced ginger, and some dried chiles. The mix was seasoned with fish sauce, a little brown sugar, and a pinch of salt. It was brought to a boil, and then boneless, skinless chicken breasts were added. The heat was reduced so the soup would simmer while the chicken cooked for about 20 minutes. Meanwhile, I cooked some rice vermicelli, grabbed some Thai basil leaves, also from my herb garden, cut some lime wedges, and opened the bottle of chile oil. Once the chicken was cooked through, it was removed from the soup, allowed to cool, and shredded. Just before serving, I tasted the soup and added lime juice and more fish sauce. To serve, I placed some noodles and chicken in each bowl, ladled the soup into the bowls, and added garnishes. To store the leftover soup, it worked well to place the noodles, chicken, and soup in three separate containers. That way, the noodles didn’t absorb any more liquid from the soup, and the soup could be re-heated by itself. With the spices, aromatics, chiles, coconut milk, and all the great garnishes, this soup was big on flavor. It hit all the notes Kurt was looking for in a soup, and the noodles and chicken made it a substantial meal. Now, I wonder when he’ll have another special request and what it will be. I tend to be a fiddler when it comes to cocktails, but it’s not that I pick up a stringed instrument after I’ve had a drink or two. What I mean is that I mix and taste and add a little more of this and then a little more of that and mix again and so on. That wasn’t the case this time though. I followed the instructions and actually really liked this just as it was with no fiddling necessary. 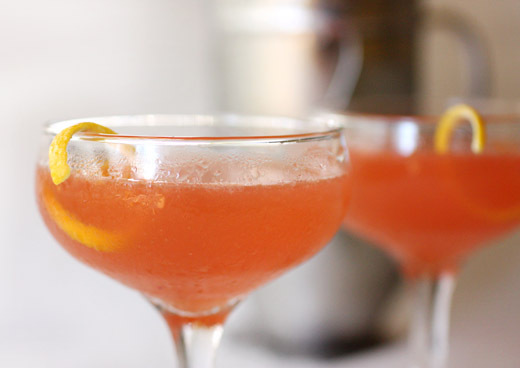 This Boston Bog cocktail recipe came from the new book The American Cocktail from the editors of Imbibe magazine, and I received a review copy. It’s a great, little book that presents drinks from each region of the US. The West chapter includes Texas, and I was proud to see Austin’s own David Alan, the Tipsy Texan, mentioned along with his Loquacious cocktail made with loquats, Tito’s vodka, and Paula’s Texas Lemon. Many of the recipes include some specific, regionally-made products, but substitutions can always be made. For instance, one of the pages I bookmarked included the Big Bay Storm from the South chapter. It’s made with Gosling’s rum, Campari, and Cheerwine soda which is made in North Carolina. Here, another cherry cola could be used instead. 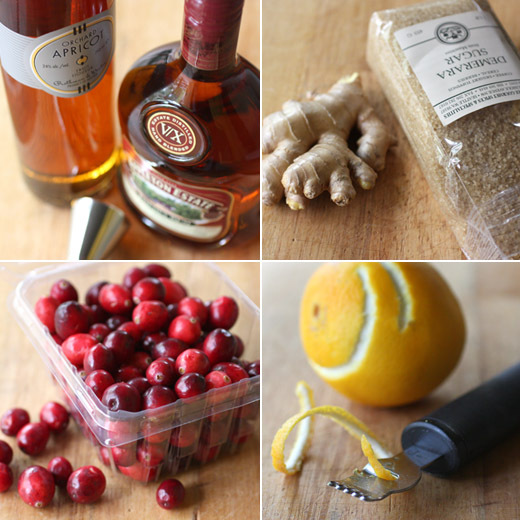 I also want to try the O’Yahderhay which is a cocktail from Wisconsin made with brandy, vermouth, and a homemade syrup with the flavors from a kringle pastry popular in Racine. There’s also a Verde Maria, like a Bloody Mary, made with tequila and tomatillos, and a Stumptown Vanilla Flip with vanilla liqueur, espresso, and orange liqueur. There are a lot of fresh flavors in the cocktails in this book, and I’ve marked so many pages, I’ll be mixing my way through most of it. With Thanksgiving on its way, I wanted to test a seasonally appropriate cocktail to be sure it would be a hit on Thursday. The Boston Bog is made with fresh cranberries and rum, and it sounded like the perfect option. 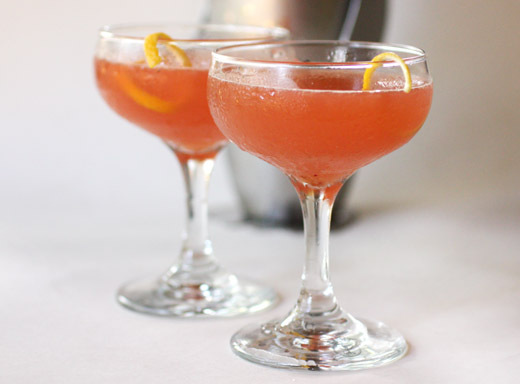 For two cocktails, about 12 cranberries were muddled in a cocktail shaker. Then, three ounces of Appleton Estate Jamaican rum and an ounce of Rothman and Winter apricot liqueur were added. I made the ginger syrup in advance, and that involved dissolving Demerara sugar in simmering water and then adding chopped ginger. The mixture was pureed in a blender and then strained and chilled. One ounce of the ginger syrup was added to the shaker along with an ounce of lemon juice and some ice. It was shaken until well chilled and then double-strained into glasses. Each glass was garnished with a twist of orange peel. The cranberries, apricot liqueur, ginger syrup, and lemon made a lovely combination, and I’m always a fan of rum. This was a serious kind of cocktail that should be offered in small portions, but the tart fruit flavors and sweet apricot and ginger syrup were well-balanced with the alcohol. So on Thursday, at some point after the parade and before carving the turkey, we’ll definitely being mixing more of these without changing a thing. Happy Thanksgiving! The other day, right after receiving a few more apples from my CSA, I saw a gorgeous apple pancake at Stacey Snacks. I used to make big pancakes like that somewhat frequently in the fall and winter, but it had been ages since I last made one. I checked my Word file of saved, keeper recipes, and there it was. Apparently, I added it to the file before I started noting where recipes originated. I now have no idea where I first found my version of the big apple pancake, but it was a little different than the version Stacey showed. I geeked out about finding the source and set about searching online to try and solve the mystery. 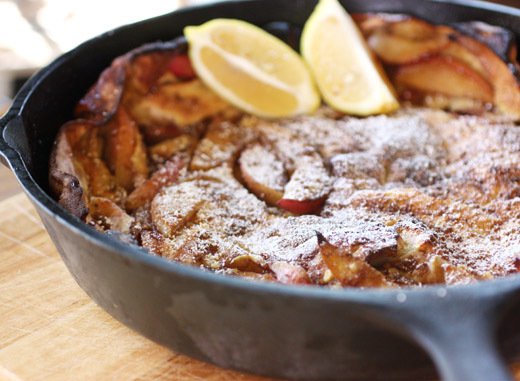 There are Dutch babies and other big pancakes with and without apples. There are baked pancakes made in skillets and some in baking dishes. But, none of the recipes I found were the same as the one in my file. The closest version I found is David Eyre’s pancake in The Essential New York Times Cookbook . The ingredient quantities are similar, and that recipe and the one I saved are the only two I’ve seen that suggest serving them with lemon. So, I failed at finding the source of my recipe, but at least I got reacquainted with a great breakfast or brunch dish. Whichever recipe you prefer, you should try one of these pancakes. 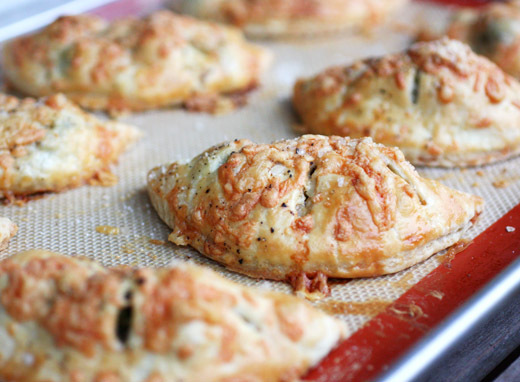 They’re easy to make, full of apples, and they puff up amazingly in the oven. 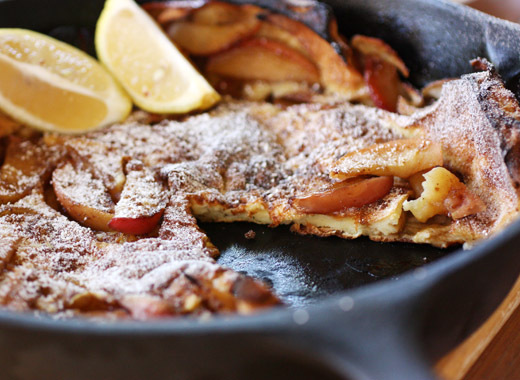 To make the pancake, you start by sauteing sliced apples in butter in an oven-proof skillet. When the apples are tender, add some brown sugar and stir to combine. Meanwhile, in a bowl, whisk together eggs, sugar, salt, milk, nutmeg, and flour. The batter is poured over the apples, the skillet is transferred to a hot oven, and it bakes for 10 minutes. At that point, you drop some cubes of butter on top of the pancake and sprinkle it with a mix of brown sugar and cinnamon. Then, it bakes for another 10 minutes and puffs gloriously. To serve, shake confectioner’s sugar on top, or squeeze some lemon over it if you’d like. The look and the flavor of this pancake so completely outweigh the effort to make it, I could easily make one every weekend while apples are in season. And, I don’t see why apples need to have a lock on this concept. Next summer, I’ll be making these with peaches instead. I get pretty excited about a new book with great recipes, and when it includes an interesting tip or two as well, I’m even more eager to use the book. With that in mind, the new book from Virginia Willis of which I received a review copy, Basic to Brilliant, Ya'll , will frequently be open on my kitchen counter. Willis combines classic, southern cuisine with perfected techniques and some French dishes that may have been given a southern twist. Every recipe in the book is presented first in its standard way, and that’s followed by a brilliant tip that makes the dish even more special. The tip might be a suggestion for the presentation, a garnish, or an added step in the process. They're all so brilliant because they’re not about adding to the cost of the recipe, they’re just about taking an additioinal step for special occasions. For instance, for the shrimp rillettes, the spread could be served with store-bought crackers or endive leaves, and the brilliant tip is to make homemade fennel flatbreads. I plan to try this for a Thanksgiving appetizer. The kale omelet would delicious on its own, but it’s made brilliant by being baked in a sourdough boule. And, the meringue pillows with strawberries and cream recipe is elevated by making dacquoise layers for a cake instead of individual meringues. 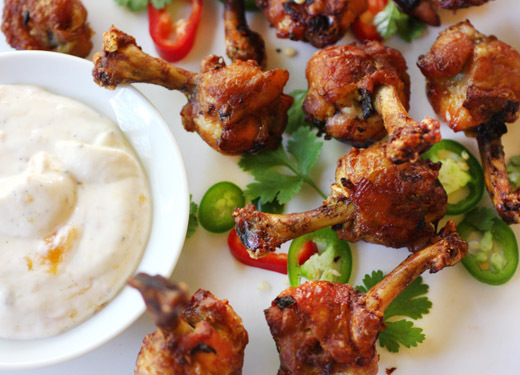 I couldn’t wait to try the curried chicken wings recipe and its accompanying brilliant tip. 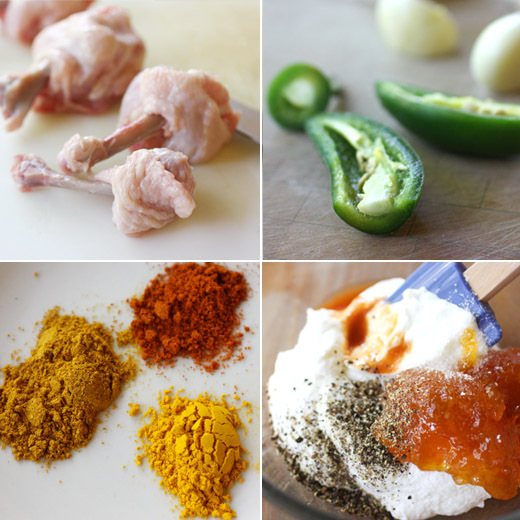 The basic recipe involves marinating chicken wings in a mix of curry powder, turmeric, cayenne, soy sauce, canola oil, chopped jalapenos, and finely chopped garlic. To up the presentation of the wings, they were turned into chicken “lollipops.” Each wing was cut into drumettes and flat pieces, tendons were cut, and the meat was pushed down the only bone on the drumette or the bigger of the two bones on the flat piece. On flat pieces, the smaller bone was then removed. You’re left with a scraped-clean bone that makes each cooked wing piece very easy to pick up and eat. After turning the pieces into lollipops and marinating them for at least an hour, they were baked while the dipping sauce was made. The sauce was a mix of Greek yogurt, peach preserves, hot sauce, and salt and pepper. Cutting the wings to form the lollipops did require some extra effort, and the flat pieces were not as easy to convert as the drumettes. However, it was absolutely worth it. They looked great, and were perfect for serving yourself from a platter. They tasted as good as they looked too. Even though I only had time to marinate the wings for one hour, the spices flavored the chicken well. And, the sweet-spicy dipping sauce was exactly right with the flavors from the marinade. 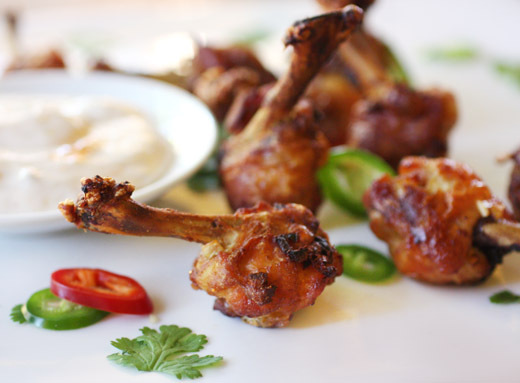 See my review of Basic to Brilliant, Ya'll and get this curried chicken wings recipe at Project Foodie. It's fitting that a book with the title Cutie Pies was made in a cute little shape. It's a small square of a book, but there are 40 recipes for pies in various shapes and sizes including cutie pies which are baked in a muffin tin, petit-5s baked in a mini muffin tin, pie jars baked in mason jars, flipsides or hand pies, pie pops which are tiny lollipop pies, and full-sized pies. This is the new book from Dani Cone of Seattle's High Five Pie and Fuel Coffee, and I received a review copy. 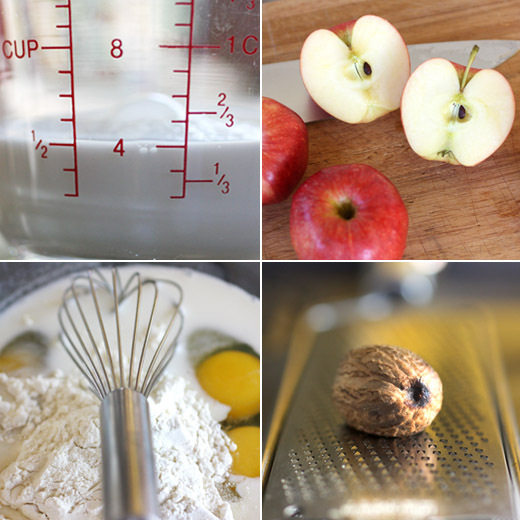 Although some pies are recommended for specific shapes and crusts, there are also tips for mixing and matching the fillings with other pie shapes and crusts where possible. And, there are both sweet and savory options in most configurations. A few ideas that caught my eye were the mac 'n cheese cutie pies, banana-blueberry pudding petit-5s, peach-ricotta-honey pie jars, caramel-pecan pie pops, and the peanut butter and jelly full-sized pie. I'm always drawn to the idea of hand pies since they're so easy to grab and go, and making savory ones sounded like a great idea for lunch. 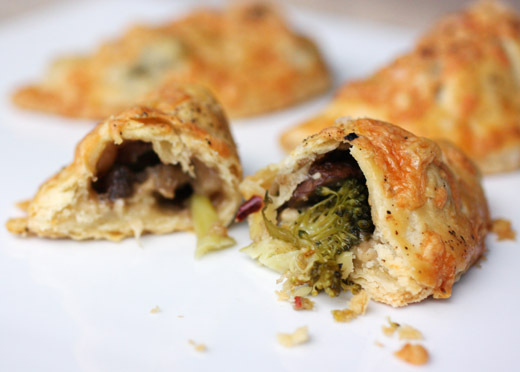 I zeroed in on the flipsides filled with broccoli, cheddar, and mushroom which are made with the all-butter crust. The crust recipe is a straightforward one, and the mixing technique suggested is using a pastry blender or your hands. I actually prefer to work butter into flour with my hands so I can feel when the pieces seem to be about the right size. So, flour, salt, and a scant teaspoon of sugar were combined in a large bowl, and cold, cubed butter was worked into that mixture by hand. Ice water was slowly added while hand mixing until the dough came together. It was wrapped in plastic and chilled for an hour before being rolled and cut into circles. For the flipsides, six-inch circles are suggested, but that seemed kind of big to me. I found a round plastic lid to use as a guide, and it measured just over five inches in diameter which seemed fine. Before cutting the dough into circles, the filling was made by combining chopped broccoli florets, chopped mushrooms, and salt and pepper. Some cheddar was grated, and I left that in a separate bowl rather than mixing it with the vegetables. That way, I could top the pies with some extra cheddar, that wasn't mixed up with the vegetables, before baking. I found that the twelve ounces of suggested cheddar was a lot more than I needed, and I think six to eight ounces would have been plenty. With all the fillings ready, the dough circles were filled, pinched to close, and then cut with a fluted-edge pastry wheel. They were brushed with egg wash, topped with more grated cheddar and a sprinkling of sea salt and black pepper, and they baked for about 30 minutes. They came out of the oven golden, crispy, and delicious. Leftovers can be re-warmed in the oven to bring back the crispness of the crust, or you could freeze extra pies before baking and then bake as needed straight from the freezer. The flipsides were fun to make and delightful to eat, and now I can't wait to try making a cute little pie on a stick. 1. In a large bowl, combine the flour, salt, and sugar, and mix well. 2. Add the butter to the flour mixture, and mix gently with a pastry blender, a fork, or your hands. The goal is to lightly incorporate the butter into the dry ingredients. The butter pieces should be well coated with the dry mixture and somewhat flattened. 3. Gradually add the water to the flour mixture, 1 tablespoon at a time, and continue mixing the dough until it comes together and forms pea-sized or crouton-sized crumbs. The dough should look like coarse individual pieces, not smooth and beaten together like cookie dough. 4. With your hands, gather the dough crumbs together to form 2 patties, gently molding the crumb-like mixture into a patty shape and being careful not to overhandle the dough. Wrap each patty in plastic wrap. 5. Chill the dough for at least 1 hour, or up to 3 days. The dough can also be frozen for up to 2 weeks. 6. When you're ready to use the dough, let it sit at room temperature for at least 10 minutes to soften it and make it workable. On a lightly floured surface, roll out each of the 2 dough patties to about 1/4-inch thickness, lightly dusting it with flour, if needed, to prevent sticking, and making sure to roll the dough evenly. 1. Preheat the oven to 375 degrees F. Place a rack in the center of the oven. Line a baking sheet with parchment paper, a silicone mat, or lightly spray with nonstick spray. 2. 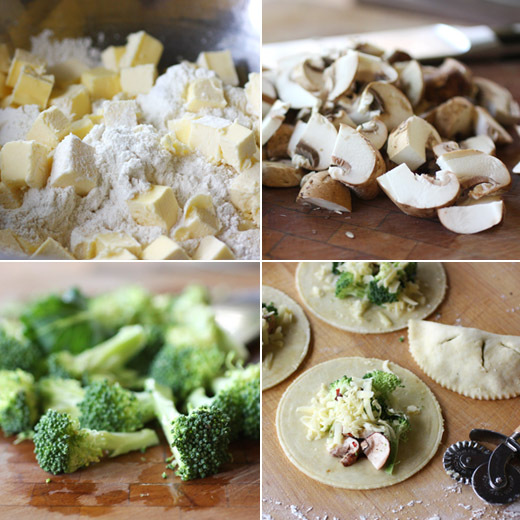 To make the filling, in a large bowl, combine the broccoli, mushrooms, and cheese, stir to thoroughly combine. 3. Pour the salt and pepper over the broccoli mixture, and toss to evenly distribute. 4. To make the crust, follow the All-Butter Crust recipe and roll out the dough per the instructions. 5. Cut 10 (6-inch) circles from the dough. Reroll the dough to make all the circles, being careful to avoid overhandling the dough. Brush each circle lightly with beaten egg, making sure to brush right to the edges. 6. Spoon the broccoli mixture evenly onto the center of the 10 circles. Pick up a dough circle so that it's lying flat(ish) in one hand. 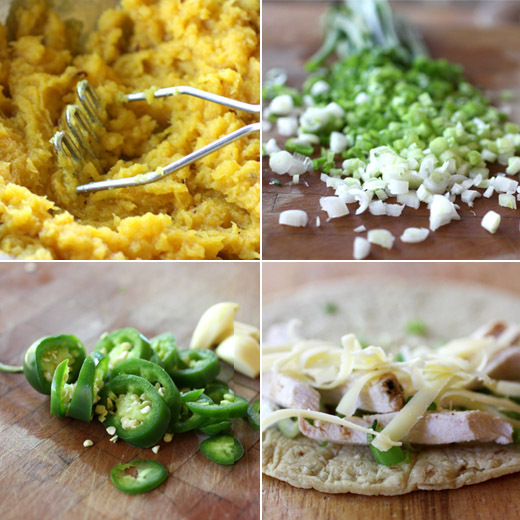 With the other hand, fold the circle up (like a taco) and tightly pinch the edges together flat to seal the crust, starting at one corner and pinching around to the other corner. Lay the circle down on the work surface, and with a fluted-edge pastry wheel, cut around the outermost edge to give the crust a neat finish. (This edge is for looks, not to seal the crust, so make sure you've thoroughly pinched the crust together.) Make 3 small slits in the top of the Flipside, and place it on the prepared baking sheet. Repeat this process for each of the 10 Flipsides. 7. Lightly brush the tops of the Flipsides with the remaining beaten egg. 8. Bake for 20 to 30 minutes, until the crust is golden. Note: I used only six to eight ounces of grated cheese, and I left the cheese separate from the vegetables rather than mixing it all together. After brushing the flipsides with the beaten egg, I added extra grated cheddar on top and sprinkled them with sea salt and black pepper. A few weeks ago, I was reading the June/July issue of Donna Hay Magazine which worked out perfectly. Since it's an Australian magazine, and our seasons are opposite, it's fine that the issues take longer to arrive here and June and July were long gone. By the time I read it, our weather had cooled off some, and I was ready to think about more wintery dishes. There were lots of lovely things made with root vegetables in one story, and another story about a dinner party around a roaring fire that ended with chocolate whisky truffles. I'll get back to those soon enough, but it was the rice puddings that I had to try first. 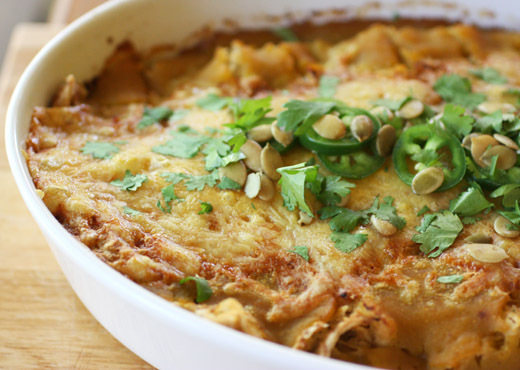 That's such a basic, comfort food kind of dish, and why I'd never made it I don't know. What made me finally want to do it was the fact that there wasn't just one flavor presented in the story. There were eight, yes eight, versions from which to choose. And, I got a little excited when one of the eight was rhubarb and creme fraiche because I had cooked some extra rhubarb and stored it in the freezer earlier in the year. So, that one was for sure, and really, I wanted to try all of the other seven, but I narrowed it down to three. 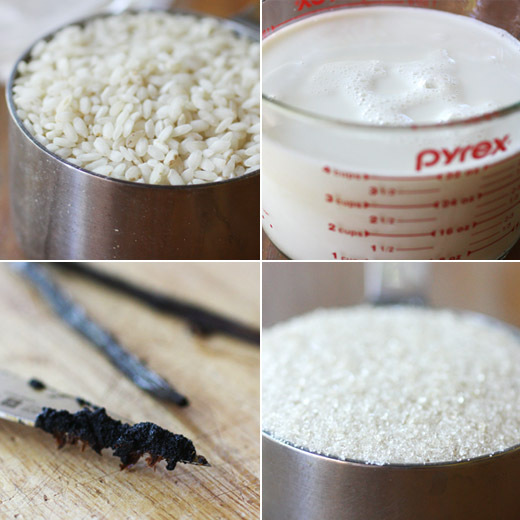 Once the basic rice pudding recipe was made, altering it or adding different toppings was easy enough. I scooped the plain pudding into ramekins, topped some with stewed rhubarb and creme fraiche, others with burnt caramel, and the remaining pudding was flavored with orange zest and topped with melted chocolate. For the basic rice pudding, all that's required is combining arborio rice, whole milk, sugar, and the seeds and pod of one vanilla bean in a saucepan and bringing it to a boil. The heat was reduced, the pan was covered, and the rice simmered while being stirred occasionally for about 30 minutes. Since I'd already cooked some rhubarb and had it in the freezer, I just let it come to room temperature and spooned it over some rice pudding in ramekins. That was topped with creme fraiche. 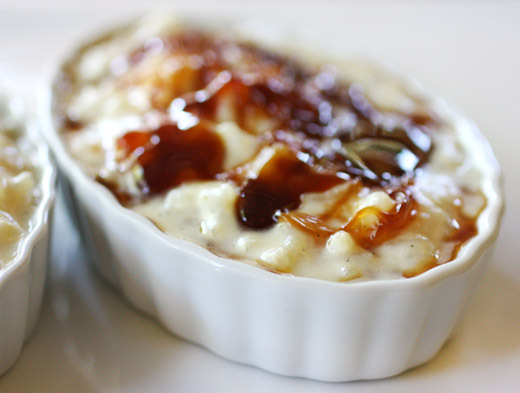 For both the burnt caramel and chocolate orange versions, some cream was to be added to the basic rice pudding first. Then, sugar was melted in a small saucepan, and the pan was swirled until the sugar became an amber caramel. It was drizzled over the rice pudding just before serving. Last, some orange zest was stirred into the remaining rice pudding, and dark chocolate was melted to top it. 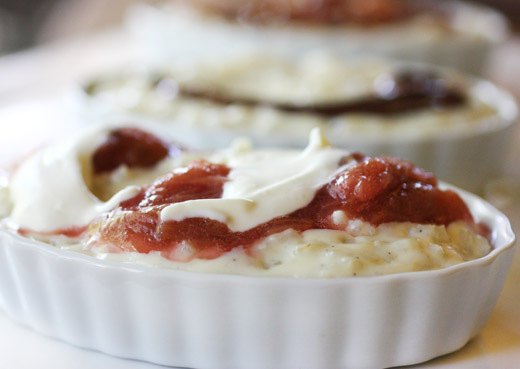 The rhubarb was fruity and tangy with the vanilla rice pudding, but a spoonful of any fruit preserves would be great too. The orange zest paired well with the swirl of chocolate which was a good contrast to the vanilla pudding. Trying all three was a lot of fun and rice pudding could be gussied in many, many ways, but my favorite of all was the burnt caramel topping. 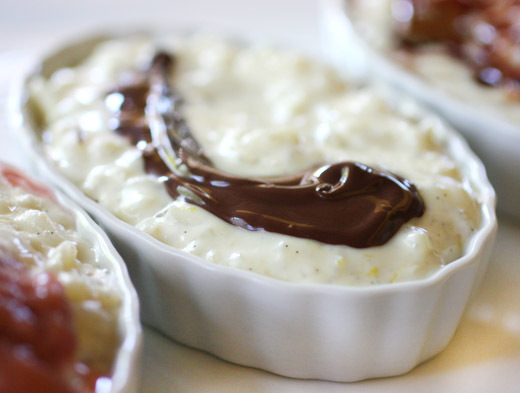 It went perfectly with the simple, basic, vanilla rice pudding which is pretty delicious even left plain. Last Friday, the Good Food Awards Roadshow was welcomed to Austin with a happy hour party. Good Food Award winner Stephanie McClenny of Confituras hosted the happy hour at Springdale Farm, and it was a mini showcase of local foods and beverages. There were samples from some Austin food artisans and a few seasonal, homemade items. Carla from Austin Urban Gardens brought a kale and butternut squash salad made with all local ingredients, and I whipped up these mini, savory muffins. The idea is from Baked Explorations where they’re suggested as regular-size muffins, but I thought minis would work better as happy hour snacks. They were made with local pumpkin from my CSA, clothbound cheddar from Brazos Valley Cheese, and eggs from Smith and Smith Farms. 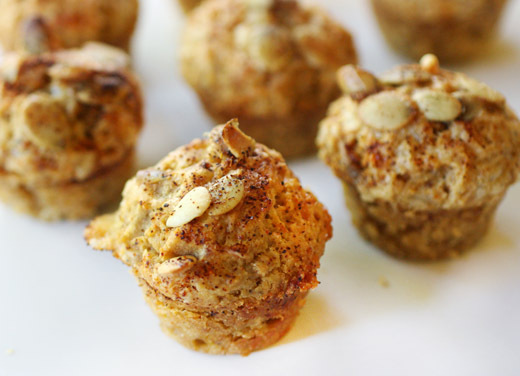 Black pepper and cayenne pepper keep these muffins firmly in the savory category, and I garnished with pumpkin seeds, a little extra finely grated cheese, and a sprinkling of mild chile powder as visual cues of their lack of sweetness. These are easy to make because everything is whisked and folded together in a bowl, and no mixer is required. Since I had a fresh pumpkin on hand, I roasted and pureed it, but canned pumpkin is suggested in the book. 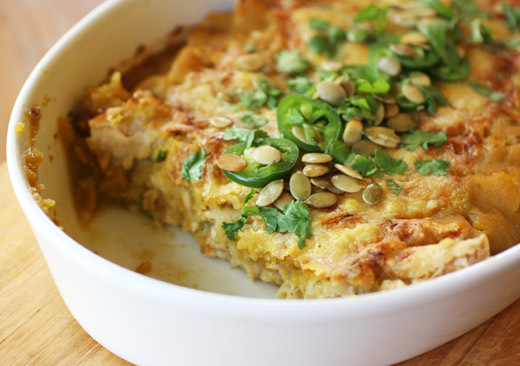 To start, that is once the pumpkin is ready, you whisk together pumpkin puree and sour cream and then add eggs and cooled, melted butter. In a separate bowl, flour, baking powder, cayenne, salt, black pepper, and brown sugar are combined, and a well is formed in the center. The wet ingredients are poured in the well, and the mixture is folded until combined. Grated cheese is folded into the batter, and this it is divided among oil-sprayed muffin cups. 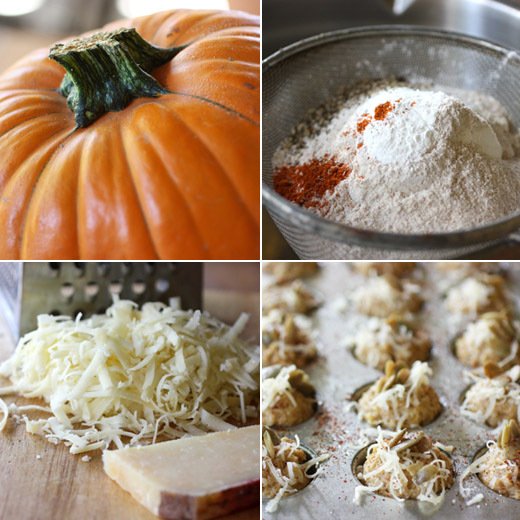 If you’d like to garnish the tops, you can sprinkle on more cheese, pumpkin seeds, and chile powder before baking. For the mini muffins, I baked them for 15 minutes. The pumpkin and cheddar worked wonders together in these little guys, and the cayenne delivered a surprising hit of spice. 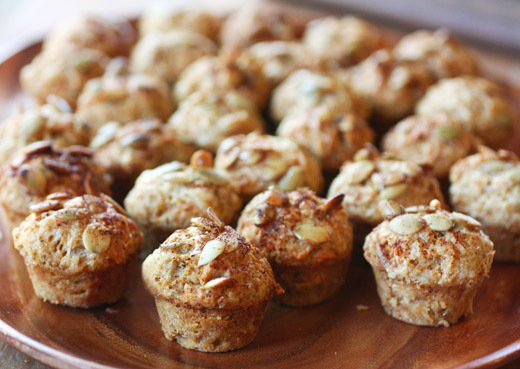 They were great as little hors d’oeuvres with a glass of wine, and I’d like to try them too, as they were intended, as regular-size muffins for breakfast. I've been reading Ruhlman's Twenty: 20 Techniques 100 Recipes A Cook's Manifesto after receiving a review copy, and it's written in such a straightforward, accessible style, it's a pleasure to read. This is no dry, kitchen science textbook. Instead, it offers twenty topics and all the ways those topics affect different types of cooking, and there are recipes with photos for each. Whatever your level of comfort with cooking, each chapter offers clear explanations of techniques and concepts that will improve your skills in the kitchen and the food you serve. From the very basics of being organized in the kitchen to seasoning to the various wonders of eggs and on and on, this book offers examples, tips, and some scientific facts about what works best and why. In the butter chapter, the basics of how butter shortens the strands of gluten in flour are explained, and then there's a description of beurre monte which is made by whisking butter into hot water and can be used to poach shellfish. There's also a mention of brown butter, compound butters, and butter used for confit. The reminders and insights about all of the uses of this one simple ingredient were an inspiration. With an understanding of basic techniques, you can cook with confidence and creativity. At the end of each chapter, there are corresponding recipes that make you want to put the ideas into practice, and it wasn't long before I was on my way to the kitchen. Chapter two is about salt, and it includes types of salt, seasoning, brining, and preserving. 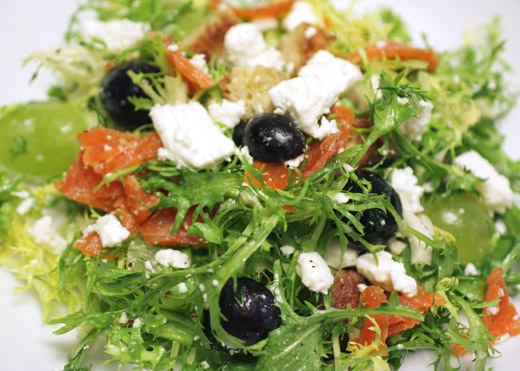 Two recipes I started immediately were the lemon confit and the citrus-cured salmon. They are both so unbelievably easy, I have no idea why I'd never tried either before. For the lemons, they're simply packed with a mix of salt and sugar, covered with water and left to cure for a month. Check back in a few weeks, and I'll be mentioning them again. The salmon is almost as simple as the lemons. I'm so glad I decided to try this right after seeing it in the book. I luckily showed up at the fish counter on the last day that fresh, wild salmon was available this year. I brought home a big fillet and prepared the cure. Two parts salt to one part sugar were combined, and a lemon, a lime, an orange, and a grapefruit were zested. Organic citrus is best to avoid any chemical residue on the outer skin when using the zest. 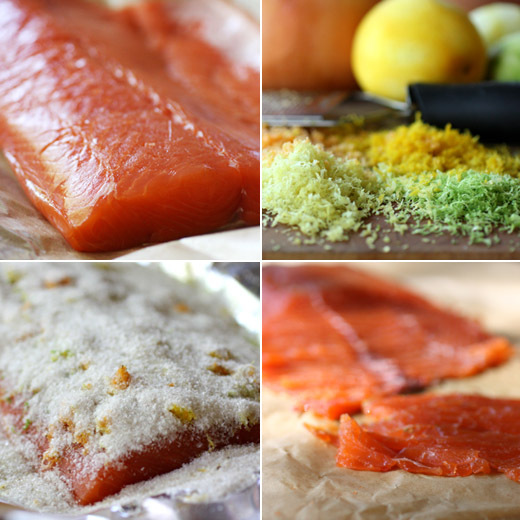 Some of the salt mixture was placed on a big piece of foil, the salmon was set on that, the citrus zests were sprinkled over the salmon, and the remaining salt mixture was poured over the top. Another piece of foil was placed over the salmon, and it was tightly folded together and sealed all around. The foil package was placed on a baking sheet, and a baking pan weighted down with jars from the refrigerator was set on top of the salmon. By pressing the salmon, more water is released as it cures. It was left in the refrigerator for 24 hours. Some recipes from other sources do suggest a longer curing time, and it depends on the thickness of the salmon. You should check it after 24 hours, and if the flesh still feels raw, leave it in the cure for another day. Since the salmon I used was rather thin, 24 hours was enough time for it to become firm. The salt mixture was washed off, the salmon was dried, and it was time to slice. The only difficulty with home-cured salmon is slicing. A long, thin, serrated knife is best, but a bread knife was the closest thing I had. I did what I could. The slices weren't nearly as perfect and lovely as store-bought cured salmon, but I was proud of them anyway. I'll definitely be curing salmon again in the future, so I'll eventually get more practice at this. 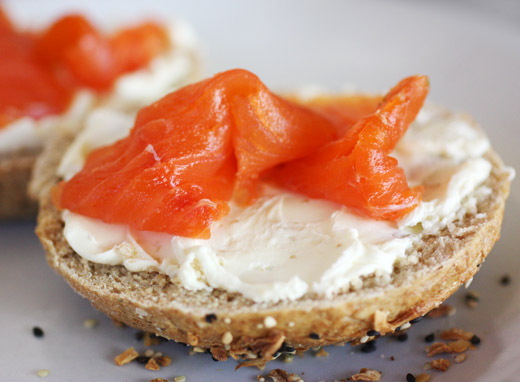 First, I had to use some salmon on a bagel. It was fresh and lovely with just a hint of citrus. Up next, I used some of the salmon in the smoked salmon panzanella with feta, dill, and grapes from the book For Cod and Country . It was a minor luxury to have so much cured salmon on hand, and now that I'm comfortable with that technique, I'm looking forward to mastering a few more of the twenty.